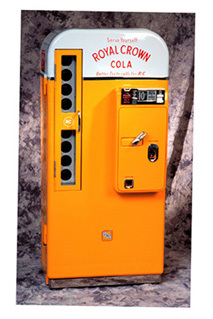 Back when we were in the restoration business the items we restored most were soda machines. The model we restored most often was the Coca-Cola Vendo 81. 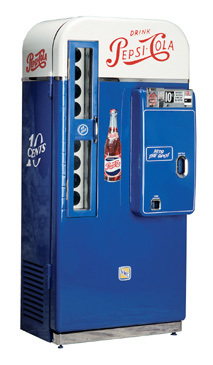 The reasons that made it our best seller are the same reasons you should consider it if you are planning on spending the time and money to restore an old soda machine. A little background. The Vendo 81 was manufactured between 1954 and 1959. We are talking about the round top mechanical coin mechanism models here. Vendo used the 81 model number into the sixties but those machines have square tops and electrical coin mechanisms and are not as desirable as the 1950’s machines. 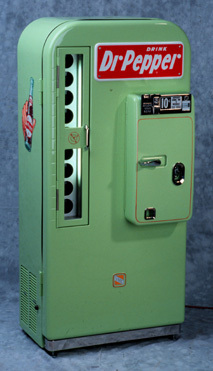 The number 81, like most old soda machines, refers to the number of bottles the machine can hold. Size – The Vendo 81 is a relatively small machine measuring 58H x 27W x 16D and weighs in at 286 lb… Compared to the monsters you see these days it is tiny and fits nicely in your home or office. Variety – The Vendo 81 has nine shelves so you can have up to nine different flavors to choose from when you open that glass bottle door. Most early Coke machines vend one size bottle and flavor and that is Coke. Versatility – The shelves on the 81 are adjustable so you can fit different sized bottles including long neck beer bottles. 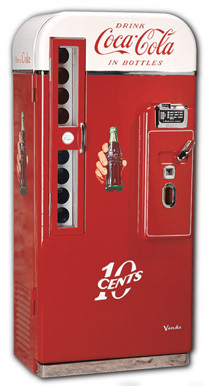 Most early Coke machines vend one size bottle and that is the 6.5 oz. bottle of you guessed it Coke. Esthetics – It is a great looking machine. Now if all you drink is Coca-Cola and you want to restore a single selection model such as the Vendo 44 or 39 that would be fine except that Coca-Cola changed the size of the 6.5 oz bottles and they won’t vend in the old machines. Vendo produced three different 81 models. The 81A which was painted all red and had a smaller version of the Coca-Cola embossing as the next model the 81B. The 81B’s embossing on the front was much bigger and looks much more proportioned. It was painted in the familiar two color scheme White top, about a quarter of the machine, separated with a strip of chrome trim with the lower section in red. 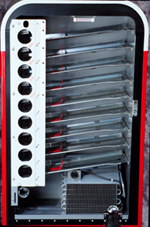 Both models have what is referred to as a small coin door. The 81D is the newest model, large embossing on the front, two tone paint scheme but it has what is referred to as a large coin door. This was needed because the coin mechanism was able to give change so it was larger and more complex. What happened to the 81C ? I’m not sure. For some reason Vendo skipped over the C.
Vendo 81’s are getting harder to find but not impossible. Look for a good solid machine with no major dents and rust. The money you think you are saving buying a beat up machine you will spend on extra body work and paint. It should be complete also, some parts are impossible to find. If Coca-Cola is not your thing the 81 is also available in Pepsi, Royal Crown, 7-Up and a generic (non embossed) that was used by Dr. Pepper. These machine were manufactured by VMC. They are virtually the same machine with only slight differences (I’m not sure what the connection was between the two companies). 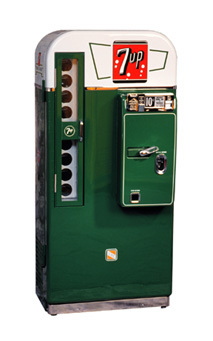 Keep in mind that VMC 81’s are significantly more expensive, with the 7-Up and Royal Crown machines being very rare. 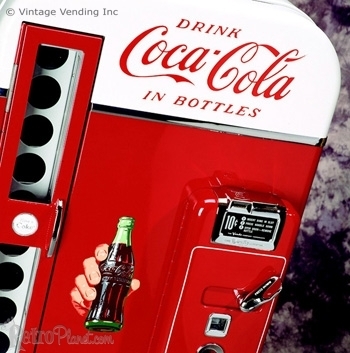 Do you own, or plan to obtain, a vintage soda machine? We’d love to hear your story.